The fan is an immediately recognizable icon of Japanese culture, and one of a small number of ancient Japanese crafts whose origins lie not across the sea in China, but at home in Japan. Much more than just a tool for cooling down, Japanese fans are entwined in the nation’s long and fascinating history. Today they remain an important artistic medium and stylish fashion accessory. Here’s a rundown on everything you need to know about Japanese fans; their history, influences, uses and where to buy them! Historically, Japanese hand fans were tools of aristocrats and the samurai class. They were a way to signify social standing, and even communicate messages. The earliest recorded sighting of the Japanese fan was in the 6th century CE, where burial tombs were adorned with pictures of fans. In the Chinese official historical record of the Song Dynasty (960–1279) it is written that the Japanese monk Chonen gifted folding fans to the emperor of China in 988, which makes the Japanese folding fan an original invention, at a time where most technological learning was going the other way. The popularity of the Japanese fan also reached into Korea: in the 11th century, Korean envoys to the Chinese court brought with them folding fans that were made in the Japanese style. Back home in Japan, during the Heian period, these fans became such a hit that laws were created to restrict their use to particular social classes. Typically crafted from Japanese cypress (known as hinoki) and thread, the number of strips of wood on each fan was meant to reflect the rank and status of its owner. By the 15th century, Japanese hand fans were so widely revered that Japan began exporting them abroad, including to China, from where they made their way onto the silk road trade route. By the 18th and 19th century, these fans had even become a desirable fashion accessory for well-to-do European women. The late 19th-century piece above, from the collection of the Victoria and Albert Museum, is one such fan which was designed specifically for export to Europe. Uchiwa: Also known as a fixed fan, these fans are typically circular with a resemblence to the silhouette of a ping pong bat. Some other variations of the uchiwa are palm-leaf shaped. In Japan, you’ll often see these styles of fan used during festivals, or by Buddhist monks as ceremonial fans. In more contemporary usage, uchiwa fans are popular promotional items for companies who want their logos flittering around town on a hot day! Sensu/Ogi: This fan is often also known more simply as a folding fan. The original incarnations of were made from bamboo covered with Japanese washi paper (find out more in our Guide to Washi Paper). Today they are typically made of paper, sandalwood, or silk, but cloth/cotton ones exist too. Sensu fans make great gifts, as they’re compact, beautiful and practical. War Fans: These fans were, as the name suggests, tools of war. They were most commonly used as a signaling device by wartime commanders, who would direct the soldiers through their movements. This Gunbai war fan contains a concealed spear for the multitasking soldier! Brisé Fans: The most decorative of all the fans, brisé fans are carved from ivory sticks or solid wooden, like this whimsical 19th century example, without the use of fabric. Each flat piece is connected by an interwoven ribbon. Intricate patterns are often painstakingly cut into the fans, creating a final effect that looks almost like fabric or lace. 3. How are Japanese Fans Used? Today, Japanese fans are most typically used for practical reasons; to keep cool during the sweltering hot Japanese summers. In times gone by, however, this was far from the case. The finest fans were considered to be of decorative use and only opened when necessary. The Edo period was a great time for artistic use of the folding fan. 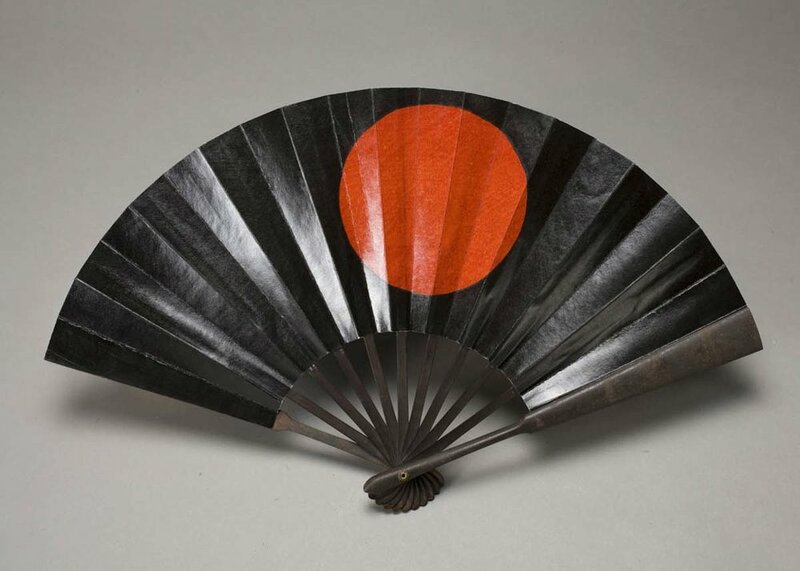 Artists like Takaku Aigai (1796–1843) created some of his most delicate works on these fans. Bamboo and Rocks by a Stream is a definite highlight. Another excellent example of Edo-era artistic fan crafting is this piece by Katsushika Isai (1821–1880). Titled Summer Flowers, it’s a stunning and delicate folding fan that has been remounted as a hanging scroll; made from ink and color on silk. Fans have also provided the inspiration for other forms of artwork, such as this lacquer wall decoration made by artist Ikeda Taishin; an excellent example of the fan motif being reinterpreted beyond its typical use during the Meiji period (1868–1912). During bloodier times, the samurai would follow their commander’s fans signals, like a silent, coded message. The war fan above is painted with a bright and striking sun motif to be easily visible at a distance. High society Japanese folk would use the fans as decorative pieces and accessories, a habit European contemporaries would follow years later. At Japanese matsuri (festival) events, fans are often used as props and extra extravagant accessories for performances. The style typically on show are uchiwa fans, the solid, flat fans usually made from paper and bamboo. These days, however, plastic and paper are common materials too. During matsuri events, you’ll often see these styles of fans wielded by spectators, who appreciate their beauty and practicality. This is an excellent example from Kyoto fan maker Kyo-Uchiwa Aiba. Sometimes the best way to understand a craft is to have a go yourself. Here are three suggestions of workshops where you can learn how to make a traditional Japanese fan yourself. If you’re looking for other creative experiences on your Japan trip, check out our guides to cultural activities in Tokyo and Kyoto. Saitama, Tokyo: Hiroyuki Shimano is a Saitama-based fan maker who has been in the business since childhood, in fact, he’s the fifth generation of Japanese fan makers in his family. Learning the art at just five years of age, he’s been running workshops for the past 25 years. His classes look at the more decorative side of fan making, and he crafts uchiwa (paddle fans) using bamboo, rice paper, and pressed flowers. The classes take about 2.5 hours and run every day except Mondays. Find out more here! Kyoto: Kyoto, the home of Japanese traditional culture tourism is where you’ll find two excellent fan making workshops. The workshop at Shiomi Uchiwa lasts about 90 minutes. During that time, you’ll listen to local artisans talk about the history of the fan, as well as try your hand at making your uchiwa fan. At less than $25 per person, this is an excellent family friendly and budget-friendly activity. You can sign up here. 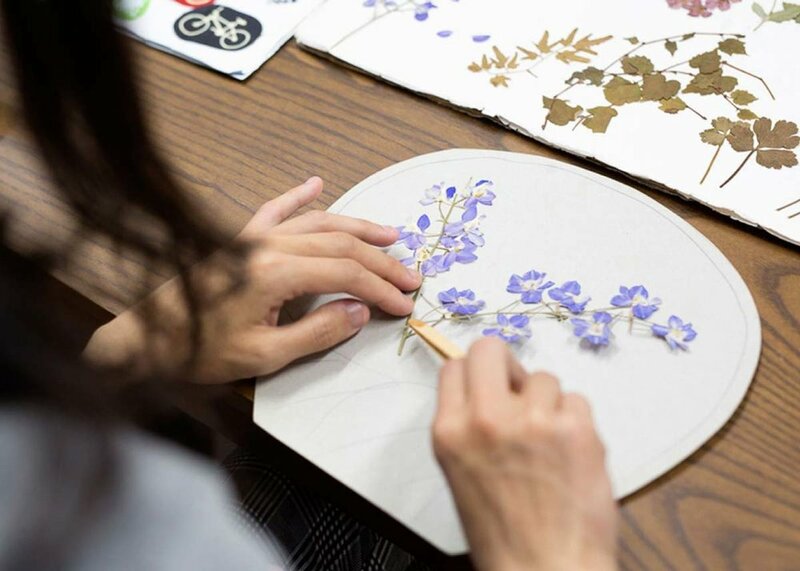 The Kyoto Handicraft Center also regularly runs craft workshops, including a Folding Fan Painting class. A little different to the others, this is for those who want to let their creativity run free, but want to leave the construction part up to the experts. The fans supplied are made of scented sandalwood. Classes take about 70 minutes and cost less than $30 per person. Visit the Handicraft Center here. If you’re looking for a stunning fan to hang on your wall or to gift someone back home, there are many places throughout the country you could add to your itinerary. The central Tokyo neighborhood of Nihonbashi is known for being home to some of the best fan retailers in the country, including Ibasen, in Nihonbashi. This store has been making some of the best Japanese fans since 1590. Kyosendo is another name synonymous with stunning fans, and they have outlets in both Kyoto and Tokyo as well as offering overseas shipping. If you’re in Kyoto, you can also try Kyo-Uchiwa Aiba for fans in the traditional local style (see map). We also have some suggestions for where you can get the best of Kyoto’s locally made ceramics here. Have you seen any great examples of Japanese fan design? Let us know more in the comments below!